‘The City of New Halos and its Southeast Gate’. 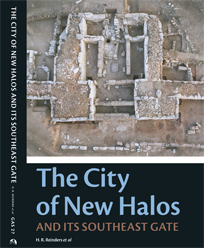 This volume presents a detailed description and analysis of the structure and layout of the Southeast Gate of New Halos, a Hellenistic city in Thessaly (Greece). The gate was excavated in the period 1995-2006. An impressive enceinte, 4.7 km long and fortified with at least 120 towers, surrounded the lower and upper town of Halos. Excavation of a series of houses in the lower town revealed that the city, probably founded in 302 BC by Demetrios Poliorketes, was abandoned after an earthquake around 265 BC. The Southeast Gate, flanked by two towers, gave access to the city from the south. Numerous artefacts show that after the earthquake the gate complex was used as a large farmstead where agricultural produce was processed and stored. Today, the walls of this well-preserved courtyard gate still stand two to five metres above the bedrock. Ordering: www.barkhuis.nl Groningen Archaeological Studies 27, hard cover, full colour, 205 pages, printing on demand, ISBSN 9789491431685. Posted on 9 August '14.